(HARLINGEN) – It was 1982. The United States President was Ronald Reagan, Michael Jackson’s “Thriller” album was released, E.T. The Extraterrestrial warmed the hearts of millions, a gallon of gas was 91 cents and Jose Salas began his career at Texas State Technical College. 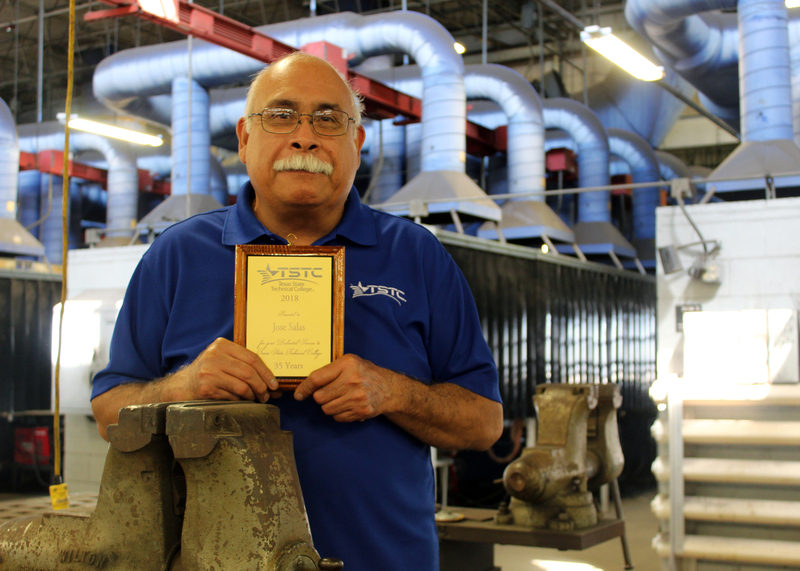 The TSTC Welding Technology instructor was recently honored at TSTC’s Employee Appreciation Day for his 35 years of service to the college. The Harlingen native began as a part-time employee in the Central Receiving department.at what was then Texas State Technical Institute. When he took the job he had just withdrawn from Pan American University, now the University of Rio Grande Valley, where he was studying kinesiology, to help his brother manage the grocery story their parents had left them when they died. So, a year later, he took a full-time opportunity with Welding Technology in the tool crib issuing tools, supplies and equipment to welding students and decided to enroll as a welding student as well. Salas is proof that it is never too late to earn a degree and make your dream come true. He didn’t earn his associate degree in Welding Technology until recently in 2004, nearly two decades after he started. Working by day and taking classes by night, Salas took his time, even gaining other opportunities during his career at TSTC as a maintenance mechanic, welding lab assistant and full-time faculty. Salas said his favorite part of his job is watching his students grow and lead successful lives and careers. TSTC Welding Instructor Kenny Moore has known Salas for nearly 30 years and has worked with him for at least two decades. Moore first met Salas as a welding student in the 1980’s. The 60-year-old Salas said his goal is to hit 40 years at TSTC. TSTC prides itself on being a great place to work and is listed as one of Harlingen’s top employers. For more information on job opportunities at TSTC, go online at: tstc.edu/about/employment. This entry was posted in Harlingen on August 6, 2018 by Amanda Sotelo Sotelo.